For most people, having a good night out will often involve drinking of some sort. This can vary between a fine bottle of wine and a lovely dinner, to a long night of heavy and prolonged drinking, dancing in a hot club or going to late night parties where drink is passed around freely. The first option is unlikely to give you too many problems, although of course it's easy to drink a lot when sitting down eating and talking with friends, but the dangers of a night out like this are low. However, for the other options, the dangers are many. Drinking over a long period of time can lead to illness, make people vulnerable to attack or abuse, can lead to fighting, arguing or getting arrested, and can make drinkers, particularly girls, vulnerable to having drinks spiked. 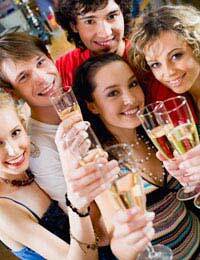 To enjoy a good night out, there are some golden rules that can make a big difference. Food slows down alcohol getting into your bloodstream and can therefore keep things on a more even keel. It also gives the body something of a stomach lining so can stop vomiting or feeling bad. In the morning you will notice the difference too, the nutrients in your system will help with the hangover. Getting into buying rounds is a sure fire way to overdoing it, particularly in large groups. People drink at different speeds, and it can often mean that you end up drinking far more, as you are drawn into round after round. This is a great way to keep things in check. Try alternating the alcoholic drinks with soft drinks as you go along. This will hydrate your body meaning that your liver has a chance to benefit. It also means the following morning won't feel such hard work and you'll enjoy the evening more too. Hydrating yourself while drinking will make you feel more energized, plus you'll be more in control of yourself. A bit like getting into rounds, drinking with mates can often lead to pressure. It goes without saying that real friends shouldn't give you a hard time for wanting to opt out occasionally, but often high spirits lead to friends encouraging each other to drink too much. If you really feel like you need an excuse to say no, try saying you have to drive later, or that you are taking medication. This can help stop any arguments or pressure. Strong continental beers have a higher alcohol content, sometimes having double the alcohol content of lighter beers. And doubles are also worth keeping an eye on, as are large glasses of wine, which can often be absolutely vast these days. Try drinking singles with plenty of mixer, or having the odd shandy or lower alcohol beer rather than lots of really strong drinks throughout the evening. Keep track of your drinks and keep a close eye on them. Don't put them down where you can't see them and don't line them up. Drinks being spiked is becoming more and more common and it's not just girls who are targeted. If you're under the influence already, you can often be distracted, leaving drinks unattended and open to contamination. Don't leave getting home to chance if you can help it. Make sure you have enough money for the cab and don't get into unlicensed minicabs. Don't walk home alone as drunk people are far more open to attack whether you're male or female, and certainly don't get lifts with strangers. Finally, don't get into the car with a friend at the wheel if he or she has been drinking. This can make a huge difference to your morning after! When you get in, drink at least a pint of water before going to sleep, and some people even swear by a couple of painkillers too. And first thing when you wake up? More water!